Cinnamomi Cortex, the dried stem bark of Cinnamomum cassia Presl (Rougui in Chinese) has been widely used in traditional Chinese medicine, cooking and perfumery for thousands of years. Traditionally, the Cinnamomi Cortex of thick size is considered to be of good quality; however, there is no scientific data to support this point. Considering that essential oils are the main bioactive components, Cinnamomi Cortex of greater variety and amount essential oils is thought to be of better quality. 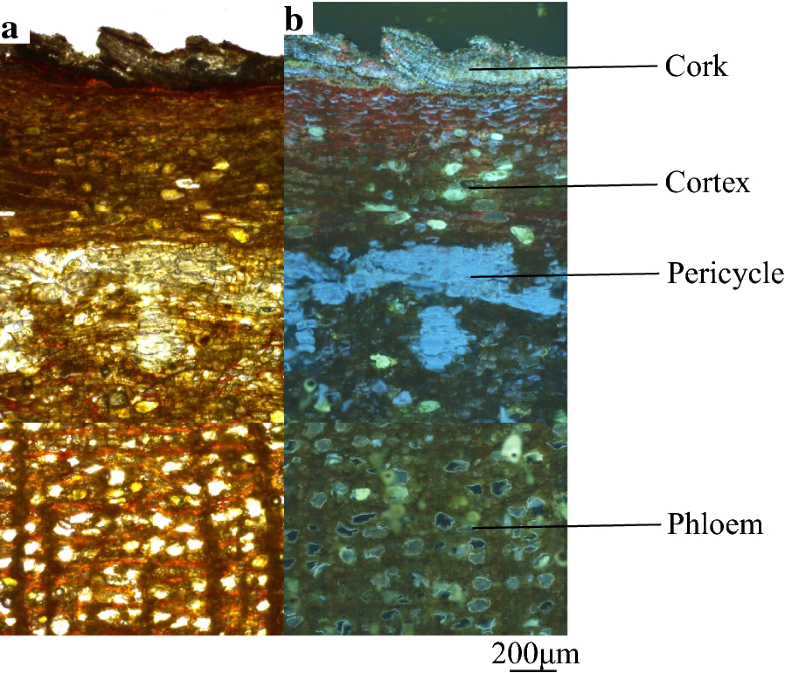 In this study, laser microdissection coupled with ultra-high performance liquid chromatography-quadrupole/time-of-flight-mass spectrometry (UPLC-Q/TOF–MS) was applied to profile the essential oils in different tissues of Cinnamomi Cortex and to determine if there is a correlation between the essential oil content and the stem bark thickness. We report the tissue-specific metabolic profiles of different grades of Cinnamomi Cortex. Nineteen chemical components were unequivocally or tentatively identified in the chromatogram of the test samples. The results indicate that the bioactive components, the essential oils, were mainly present in the phloem. Phloem thickness is the key character for evaluating the quality of Cinnamomi Cortex. Our results can be of great importance in improving the cultivation, harvesting, and processing of Cinnamomi Cortex, as well as enhancing its effects in clinical applications. Cinnamomi Cortex, is the dried stem bark of Cinnamomum cassia Presl, known as Rougui in Chinese. It has been widely cultivated in Southeast Asia and is commonly used in pharmaceuticals, cooking and cosmetics. Essential oils have been proven to be the main active components of Cinnamomi Cortex , with cinnamaldehyde making up between 17.1 and 87.23% of these oils . Coumarin, cinnamyl alcohol, cinnamic acid and 2-methoxycinnamaldehyde also comprise significant proportions of the essential oils . Previous pharmacological studies have demonstrated that the essential oils of Cinnamomi Cortex have antioxidant, antidiabetic, anti-platelet aggregation and antifungal activities [4–7]. Thus, in this study, five compounds, namely coumarin, cinnamyl alcohol, cinnamic acid, cinnamaldehyde and 2-methoxycinnamaldehyde, were selected as chemical markers for determination. Currently various specifications of different grades of Cinnamomi Cortex have been found in the herbal market, such as Zhong tong (cylindric as sample RGgxdxzt), Ban gui (plate-like as sample RGgxpnbg), and Guan gui (scroll-like or groove shape as sample RGgxpngg). In clinical applications, they are typically used without discrimination, but is there a clinical difference? Comparing the chemical composition of different grades will enable us to determine the difference between grades and will help us evaluate whether these differences are significant in terms of applications. Modern laboratory studies have focused on HPLC-based fingerprint chromatography and determination of characteristic components [8–10]. However, evaluating the quality of Cinnamomi Cortex by modern instruments is time-consuming and inconvenient. Traditionally, the Cinnamomi Cortex of thick size is thought to be of good quality; but there is no scientific evidence to support this point. In the present study, various samples of Cinnamomi Cortex of different grades were collected for tissue-specific chemical analysis combining laser micro-dissected system (LMD) with ultra-performance liquid chromatography quadrupole time of flight mass spectrometry (UPLC-Q/TOF–MS). Through this study, the relationship between microscopic features and active components can be established; this relationship will enable people to evaluate pharmaceutical quality of Cinnamomi Cortex by appearance. The research also provides helpful information that can guide the cultivating, collecting and processing of Cinnamomi Cortex for maximum quality in applications. The plant materials were collected from six major cultivation areas. Table 1 shows the details including sources and morphological descriptions for each sample. Figure 1 shows the characteristic appearance of a sample. All the plant materials were identified by Prof. Zhongzhen Zhao, School of Chinese Medicine, Hong Kong Baptist University. The voucher specimens are deposited in the Bank of China (Hong Kong) Chinese Medicines Centre of Hong Kong Baptist University. Chemical standards including coumarin, cinnamyl alcohol, cinnamic acid, cinnamaldehyde and 2-methoxycinnamaldehyde were purchased from Shanghai Tauto Biotech Company (Shanghai, China). The purity of each standard was over 98%. Acetonitrile and methanol of HPLC grade were from E. Merck (Darmstadt, Germany), and formic acid of HPLC grade was from Tedia (Fairfield, USA). Water was purified using a Milli-Q water system (Millipore; Bedford, MA, USA). Leica Laser microdissection 7000 system (Leica, Benshein, Germany), Agilent 6540 ultra-performance liquid chromatography quadrupole time of flight spectrometer equipped with a mass hunter workstation software (Agilent version B.06.00 series, Agilent Technologies, USA), Cryotome (Thermo Shandon As620 Cryotome, Cheshire, UK), Ultrasonic instrument (CREST 1875HTAG Ultrasonic Processor, CREST, Trenton, NJ), Centrifuge (Centrifuge 5417R, Eppendorf, Hamburg, Germany), Electronic balance (Mettler Toledo MT5 style), Nonfluorescent polyethylene terephthalate (PET) microscope steel frame slide (76 × 26 mm, 1.4 μm, Leica Microsystems, Bensheim, Germany), Centrifuge tube (500 μL, 1.5 mL, Leica), HPLC grade vial (1.5 mL, Grace, Hong Kong), glass insert with plastic bottom spring (400 μL, Grace, Hong Kong), Acquity UPLC BEH C18 column (2.1 × 100 mm, 1.7 μm, Waters, USA), C18 pre-column (2.1 × 5 mm, 1.7 μm, Waters, USA). The dried medicinal materials were firstly softened by infiltrating with water-soaked paper. The softened Cinnamomi Cortex was cut into small sections, fixed by cryogen, and then frozen on a − 20 °C cryobar. Serial slices of 40 μm in thickness were cut at − 10 °C. Each cross-section of tissue was mounted directly to a non-fluorescent polyethylene terephthalate. The slide was exposed under a Leica LMD 7000 microscopic system. Microdissection was conducted by a DPSS laser beam at 349 nm wavelength, aperture of 30, speed of 3, power of 50 μJ and pulse frequency of 1695 Hz under a Leica LMD system at 6.3 × magnification. Four different target tissues, approximately 1 × 106 μm2 per each, were individually separated. The microdissected tissues fell into caps of 500 μL micro centrifuge tubes by gravity. Lastly, the separated tissue part in each cap was transferred to the bottom of the tube by centrifuging for 10 min (12,000 rpm, 17 °C). 100 μL methanol was added into each micro centrifuge tube. The tube was sonicated for 60 min and then centrifuged again for 10 min (12,000 rpm, 17 °C). 90 μL of the supernatant was transferred into a glass insert with plastic bottom spring in a 1.5 mL brown HPLC grade vial and stored at 4 °C before analysis. Each standard compound was accurately weighed by an analytical balance and dissolved in methanol to produce mixed stock solution with concentrations at 103.05 μg/mL of coumarin, 12.32 μg/mL of cinnamyl alcohol, 132.7 μg/mL of cinnamic acid, 106.94 μg/mL of cinnamaldehyde, 157.6 μg/mL of 2-methoxycinnamaldehyde. A series of mixed standard solutions was prepared by dilution with methanol. The UPLC-Q/TOF–MS analysis was conducted at room temperature (20 °C). The mobile phase consisted of 0.1% formic acid–water (A) and 0.1% formic acid-acetonitrile (B). The gradient program was optimized as follows: 0–8 min, 5–35%B; 8–21 min, 35–65%B; 21–27 min, 65–100%B; 27–31 min, 100%B; 31–31.1 min, 100–5%B; 31.1–35 min, 5%B. The injection volume was 3 μL for each sample. The flow rate was set at 0.4 mL/min. The mass spectra was acquired in positive mode with mass to charge ratio (m/z) ranging from 100 to 1700. The operation parameters of the mass spectrometer were set as follows: dry gas temperature, 300 °C; dry gas (N2) flow rate, 8.0 L/min; nebulizer pressure, 40 psi; capillary voltage, 3500 V; nozzle voltage, 500 V; and fragmentor voltage, 120 V. The energies for collision-induced dissociation (CID) for fragmentation were set at 20 and 35 eV. Linearity, limits of detection (LODs), limits of quantification (LOQs), repeatability, stability, intra-day precision and inter-day precision were assessed. A series of diluted mixed standard solutions was analyzed subsequently from low to high concentration for linearity, LODs and LOQs. 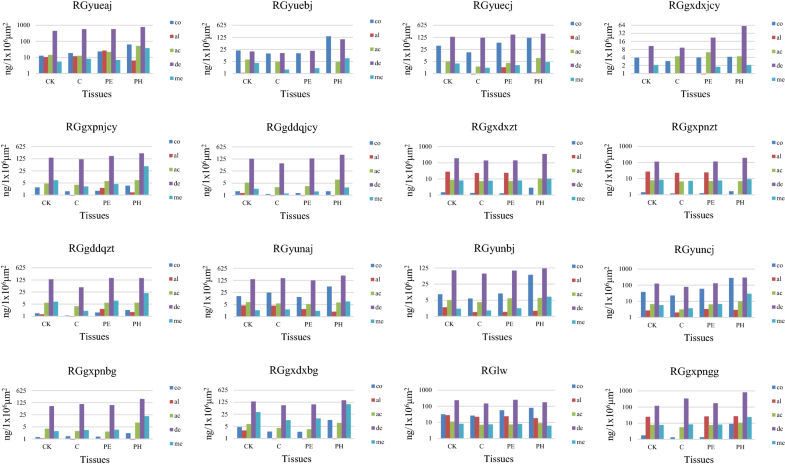 The phloem of RGyueaj was selected for validating the method’s repeatability and stability. Repeatability was evaluated by six replicated analyses of the phloem at the similar locations in six tissue slices. Stability was tested on one sample solution at 0, 12, 24, 36, 48 h. Intra-day precision was performed by analyzing five replications of the mixed standard solution in 1 day while inter-day precision was examined by analyzing three replications of the solution in three consecutive days. As shown under the normal light and fluorescence mode (Fig. 2), the transverse section of Cinnamomi Cortex could be divided into four portions: cork (CK), cortex (C), pericycle (PE) and phloem (PH). Cork consists of several layers of cells and emits bluish-grey fluorescence. Cortex has a scattering of stone cells. Dark brown fluorescence was emitted from cortex to phloem, while a bright blue color was emitted from the pericycle. Pericycle was arranged in an interrupted ring. Phloem was broad with rays 1–2 rows of cells wide. Since different tissues possessed various features and could be distinguished under fluorescence mode, each separated tissue was dissected at the size of about 1,000,000 μm2 by LMD. 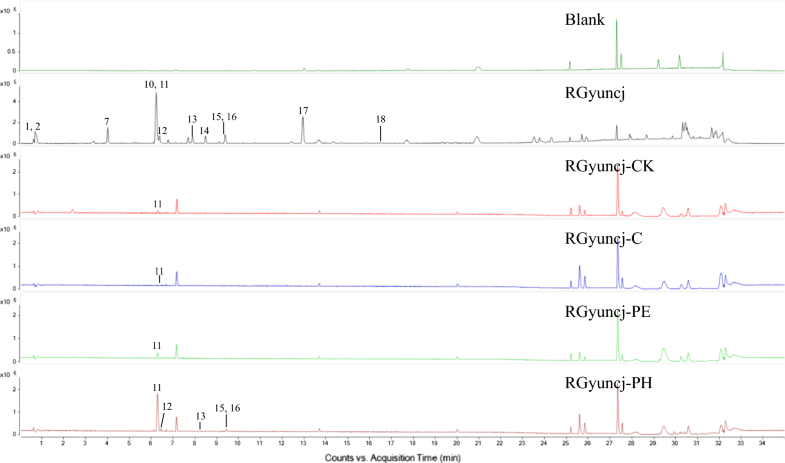 Tissue-specific chemical profiles were obtained as base peak chromatograms by UPLC-Q/TOF–MS (representative chromatograms are showed in Fig. 3). 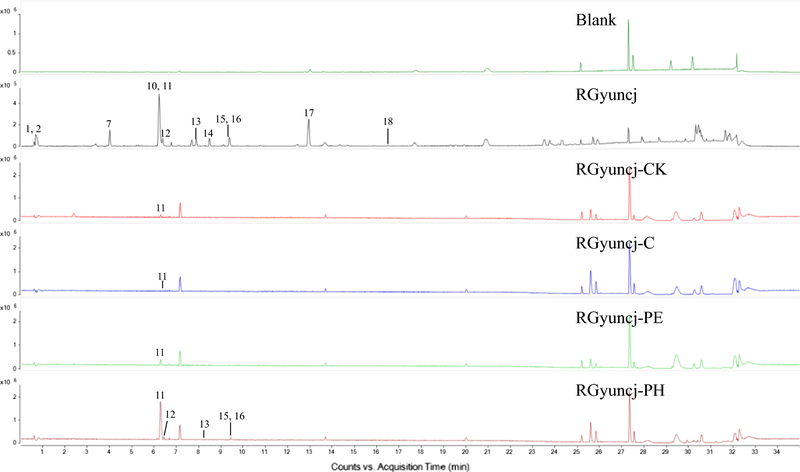 A total of 19 peaks were unequivocally or tentatively identified in the chromatogram of the medicinal material sample RGyuncj by comparing their retention times, m/z of molecular ions and/or fragment ions with standards or reported references [2, 11–16]. Five peaks were positively identified. Peaks 11, 13, 14, 15 and 16 were unambiguously identified as coumarin (147.0438 m/z, [M + H]+), cinnamic acid (149.0595 m/z, [M + H]+), cinnamaldehyde (133.0647 m/z, [M + H]+), cinnamyl alcohol (135.0802 m/z, [M + H]+) and 2-methoxycinnamaldehyde (163.0750 m/z, [M + H]+), respectively. 13 peaks were tentatively identified by comparison of their molecular ions of [M + H]+ or [M + Na]+ from literature reports. The detailed results are shown in Table 2. As seen from Table 3, peak 10 couldn’t be detected in any tissue of any sample. It can be assumed that the content of peak 10 is below LOD in herbal tissues. The totality of chemicals in cortex (5–12 peaks) and phloem (5–10 peaks) was slightly greater than those in cork (4–8 peaks) and pericycle (5–8 peaks). Peaks 11, 13, 14, 15, 16, namely coumarin, cinnamic acid, cinnamaldehyde, cinnamyl alcohol and 2-methoxycinnamaldehyde, could be detected in almost every tissue. Distinctly, the areas of these peaks were larger than those of other chemicals. Therefore, further quantitative analysis of them was carried out. The results of method validation are presented in Table 4. The regression equation for each compound was calculated in the form of y = ax + b, where y and x were peak area and amount of compound injected, respectively. Each calibration curve possessed good linearity with correlation coefficients (r2) ≥ 0.9953 within the selected range. The LODs and LOQs were determined at signal-to-noise (S/N) ratios of 3 and 10, respectively. The repeatability ranged from 5.34 to 27.56%. The RSD value of stability was less than 11.66%, indicating that the stability of current method in this study was acceptable. The above assay results indicate that this developed method is reproducible, precise and sensitive enough for tissue-specific determination of five analytes in Cinnamomi Cortex. The results of quantitative analysis (Additional file 1: Table S1 and Fig. 4) demonstrated that the content of cinnamaldehyde was much higher than other chemicals. Cinnamaldehyde was concentrated in phloem except for sample RGlw, where it was most abundant in the pericycle. 2-methoxycinnamaldehyde showed the same pattern of occurrence as cinnamaldehyde. 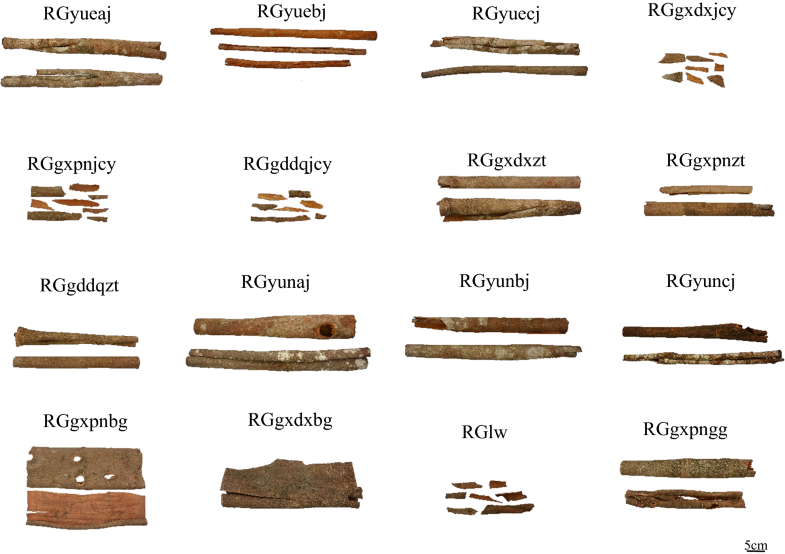 Cinnamic acid was enriched in pericycle of sample RGgxdxjcy and in cork of samples RGgxpnzt and RGlw as well as in phloem of other samples. For all samples, phloem contained the highest amount of coumarin. Cinnamyl alcohol showed the highest content in phloem of one sample, in pericycle of six samples and in cork of others; thus, for this component, the pattern of distribution was difficult to determine. The irregularity may be due to its low content and/or its tendence to esterify easily. In the present study, an approach using LMD combined with UPLC-Q/TOF–MS was established to map the distribution of essential oils in tissues of various specifications of Cinnamomi Cortex. It is the first report with respect to tissue-specific metabolites in the cortex of an herb. This histochemical study identified Cinnamomi Cortex phloem as the tissue richest in essential oils. Thus, it would be logical to deduce that Cinnamomi Cortex with thick phloem is of better quality as it contains more active constituents. In fact, this is consistent with the traditional processing method of removing the outer bark. Our analytical method provides references for evaluating the quality and classifying the grades of Cinnamomi Cortex by thickness of phloem. Further studies can be conducted to explore the factors affecting phloem thickness. Therefore, this research can be of great importance in the cultivation, harvesting, processing and clinical application of Cinnamomi Cortex. WZ and ZL initiated and all authors designed the study. WZ carried out the histochemical experiment and drafted the manuscript. PL and ZZ provided technical support. All authors contributed to the data analysis and to finalizing the manuscript. ZZ has made his intellectual contributions in authenticating the materials. JC contributed her intellectual content for revising the manuscript. All authors read and approved the final manuscript. This work was supported by the National Natural Science Foundation of China (NSFC) (Project No. 11475248). We acknowledge Mr. Alan Ho from the School of Chinese Medicine, Hong Kong Baptist University, for his technical assistance. We also acknowledge Shenzhen Tsumura Co. Ltd for the help in sample collection. 13065_2018_438_MOESM1_ESM.docx Additional file 1: Table s1. Contents of essential oils in various tissues of the samples.